This entry was posted in Classes & Workshops, Other, Uncategorized. Bookmark the permalink. 8 Responses to Serious Music Students? David gives you a lot of basic music theory early on that seems to make sense and you think you understand. I have taken lessons for about one year and I am spending time going over all the early material I thought I knew. It all makes more sense now and is quite useful in realizing how everything fits together. As in many things, a lot of the basics don’t seem that important in the beginning but need to be reviewed as one advances. I was a student of Dave’s in the fall semester. 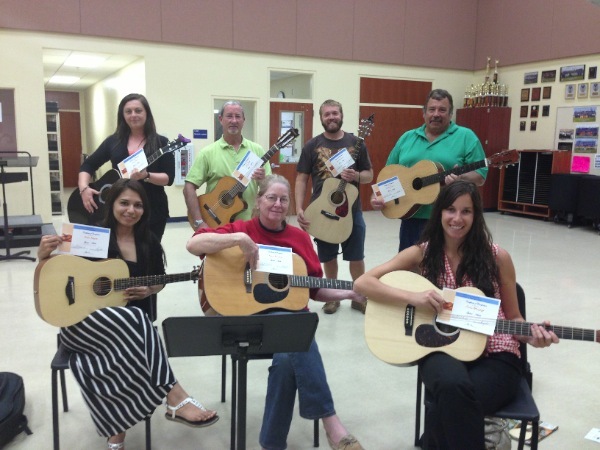 Fourteen adult students attended the first class. I truly believe everyone started out with good intentions. We soon realized that it takes a certain level of commitment and discipline to become even marginally proficient at playing the guitar. A few became frustrated at their inability to produce music after the first lesson, and unable to satisfy their need for instant gratification, traded in their guitars for a nice harmonica. Most perhaps thought it would take more time than they could spare, and wouldn’t commit. Then again, there are some people who couldn’t get music out of a transistor radio no matter how hard they try, so no shame to them. The three of us who toughed it out to the end can honestly say that we tried. That’s right, three. We came away from the experience with perhaps the most important knowledge one can expect to glean from eight hours of rudimentary instruction in a high school adult-ed course. We learned that we needed to learn, and that the only way to do that was to put the time in and practice. Dave is a talented musician and able instructor. He will teach you if you’re willing to learn. My best advice is to put in the time. You will become more comfortable with practice. Your fingers will do what you want them to do, and you will start to sound good. I really enjoy playing my guitar, and know I will keep getting better as time goes by. You will too, please believe me. Don’t let more time go by before you do something nice for yourself. 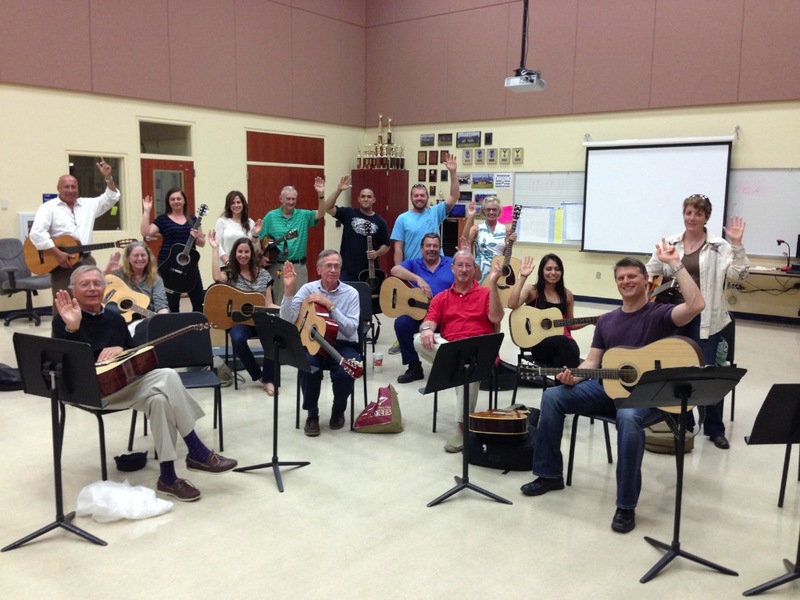 I started out about 5 years ago at one of these community education classes (PBG high school), at the time I only knew 2 chords and no songs. There were about 15 of us starting out–only 3 or 4 made it to the end, and 2 of us went on to join Dave’s weekly bluegrass class. After about 3 1/2 years I was asked to join a bluegrass band with other musicians (banjo, mandolin, and other guitars)— and I’m also now playing bass guitar in the band and having a blast doing it all. We’ve even added electric pickups and amplifiers and have been doing some singing. I have about 40-50 songs in my portfolio, and keep adding to the list as Dave publishes more songs. No doubt it has taken considerable personal commitment and lots of practice time, but well worth it. And now I’m learning to play the blues in Dave’s weekly Blues class. It’s all a good time, but its also important to learn the basics (scales, song structure, chords) which will help you in the long run. Stick with it and you’ll be glad you did! Learning to play guitar, or any instrument, is hard work. But it IS worth it. In the beginning especially, it will seem like a lot of work and frustration with very little pay-off. But if you keep the faith and stay with it, the day will come in the near future when you realize that you are actually making music! Its a great feeling! At that point you will know that it is something that you can do. It will still require a lot of work to get better, but it will be fun. I started out in one of those Gardens High School classes about 5 years ago. I didn’t even know how to hold the guitar, let alone play it. Eight weeks later there were 2 of us left. I was surprised at how much practice it took EVERY DAY just to gain the most basic skill at playing. The learning curve is steep at the beginning, but it’s totally worth it. After a few years I moving into electric guitars (gibsons, fenders – you name it) and it REALLY became worth it. Now I’m watching my 9 year old son struggle through that same steep learning curve to just make clean chords, and I feel for him. But I keep reminding him that if it was easy everyone would/could do it – and it wouldn’t be so cool. I’m a trial lawyer by trade. It took a lot of work to get where I am. It’s still a lot of work. But, like anything else, Nothing truly worthwhile in life comes without discipline and work. Stick with it – grind through the learning curve. If you quit you will always regret it. I also started at one of the Gardens High School classes. But that was not the first time I picked up a guitar. I got one as a gift in high school and spent the next ten years or so picking it up, learning a couple of chords, and then giving up on it multiple times. Then I moved and sold or gave away the guitar. Afterwards, I did regret giving it up. Years later, my wife gave me another guitar and pointed out the class at the high school, which I started just for something to do that was not work. Now five years later, I’m so glad I did it and did not give up this time. It takes a lot of practice. Lots of times I don’t practice enough even now. I’m shy enough that I don’t necessarily like playing songs in front of an audience, but I have been able to anyway sometimes. The thing that’s helped me most in doing that is practice, of the songs, of theory, of scales. And playing slow when I am learning a new song or a new riff. I agree with Andy: stick with it. Even if it is hard, I find that it’s a lot of fun too. Learning an instrument is truly a healthy hobby! Practicing and taking lessons consistently will help them gain so much more enjoyment and satisfaction from it. Congrats to the seven! Hopefully, many will go on to perform for the public. Perhaps some will just simply enjoy learning to use their talents. In either case, they’re developing skills that can certainly last a lifetime!